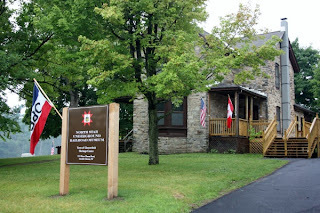 The 185th camped outside of Washington and Company F was mustered out on May 30th. On June 1st, Ira Brum died. According to his obituary, he was the only &#8220colored man in his company, and possessed the confidence and good will of his officers and comrades.&#8221 He was reported to be a good soldier and &#8220had distinguished himself in many of the hard-fought battles which preceded the fall of Richmond and Lee’s surrender.&#8221 Brum was just thirty years old and left a wife and daughter in Cortland County and his mother, father and siblings in Ithaca. The Brum family monument is in the Ithaca City Cemetery. New York State agreed to allow African Americans to enlist in United States Colored Infantry in the fall of 1863 and these men fought in federal units. The 20th USCT was recruited in New York City- the 26th USCT was filled with many men from the Southern Tier. 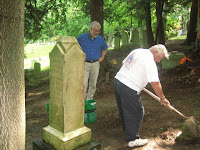 In the spring, the Tompkins County Civil War Sesquicentennial Commemoration Commission will repair the Brum grave, now in pieces in the Ithaca City Cemetery. It would be interesting to know if other African American men fought in white New York regiments. 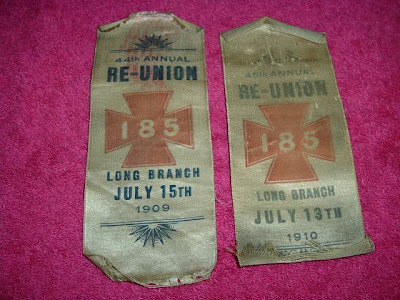 Photo: Above, reunion ribbons from the 185th New York Regiment- below, the 185th’s service during the war. Very interesting. Thanks for sharing. I wouldn’t have thought that any African Americans were serving in white units. It doesn’t get mentioned much and maybe it should! I’m sure he couldn’t have been the only one! Cherylis correct, he was not the “only one.” I have documented 6 other black men who served with regular NYS line regiments. One received the MoH. I was on a panel this October during the conference of ASAHL in Richmond Virginia. One of the speakers was Juanita Patience Moss She wrote a book and delivered a presentation on” Forgotten Black Soldiers in White Regiments During the Civil War” Heritage Books Westminster Maryland 2008. It is a wonderful book and identifies some interesting people. John Wayles Jefferson (Hemmings) and 2000 others not included in the regular listings of The United States Colored Troops. However, Ira Brum was not included in her list. He is another wonderful surprise. How ever she identifies over 250 Blacks who served in New York’s White regiments. Her book is a must have for Civil War collector’s. She is working in a long ignored area, that of soldiers who were subject to General Order 323. Ms. Kammen is identifying a black man who joined a all white unit and served as a combat soldier.